Buster Blackjack can be basically any blackjack variant that comes with Buster side bet. As its name would suggest, Buster Blackjack is all about making extra profit each time the dealer busts, and you are required to place an additional wager on top of the standard blackjack bet in order to qualify for payouts that can go up to staggering 2,000 to 1. The common Buster payouts are based on the number of cards the dealer busts with, but there are additional options, such as Double Attack Blackjack with Bust It! side wager, where the payouts are based on the bust card itself. It is important to note that casinos tend to add this particular bet to different blackjack games and even mix Bust It/Bust Out/Buster names, which means that you should not let the title mislead you and pay attention to the basic rules of the game and the payouts. Buster Blackjack is usually played with six decks of cards, and it is worth mentioning that the side bet can only be placed alongside the standard blackjack wager. Considering that the house edge on each side wager is much higher when compared to the base game payouts, Buster Blackjack is probably not the best game if you want to turn a profit, but it is definitely much more exciting than most other titles. 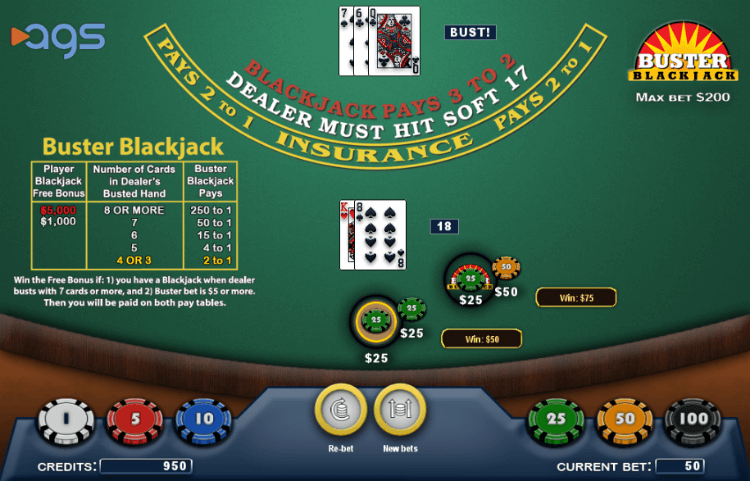 Blackjack and Insurance usually pay 3:2 and 2:1 respectively, while other winning hands award even money payout. The dealer stands on soft 17, which is a good thing for the players, whereas other important rules are featured below. Seeing that the house edge on Buster side bet is as high as 7%, you should probably steer clear of the side wager if you want to have any chance of turning a profit in the long run. But blackjack is not just about the odds and the main goal is to have fun, so if you are after bumper payouts, then you should give it a go. Buster Blackjack is a multi-hand game that supports three hands per round, and with bet limit on the side wager going up to £250, chances are that blackjack high rollers will be more inclined to disregard the poor payout percentage and attempt to land a payout of up to 2,000 to 1. The bottom line is that if you are not a casual gamer and tend to spend a lot of time playing Blackjack in online casinos, you would be better off skipping the side bet altogether, but if you are looking to add some thrill to the game and love the possibility to walk away with a massive jackpot, then you have no reason not to enjoy this exciting game.